The Ukrainian government and militias in the Donetsk region traded allegations over who shot the aircraft down. 298 people on board a Malaysia Airlines plane were killed on Thursday after the aircraft was shot down in eastern Ukraine, near the Russian border. The aircraft was on its way from Amsterdam to Kuala Lumpur. Several Ukrainian government officials have blamed separatists in the region for shooting down the aircraft, something that has been met with strong denial by the militias. The Malaysia Airlines plane crashed roughly 80 kilometers from Donetsk, near the village of Snezhnoe. Ukrainskaya Pravda cited sources as saying that connection with the plane was lost when it was at an altitude of 10,000 metres above sea level. 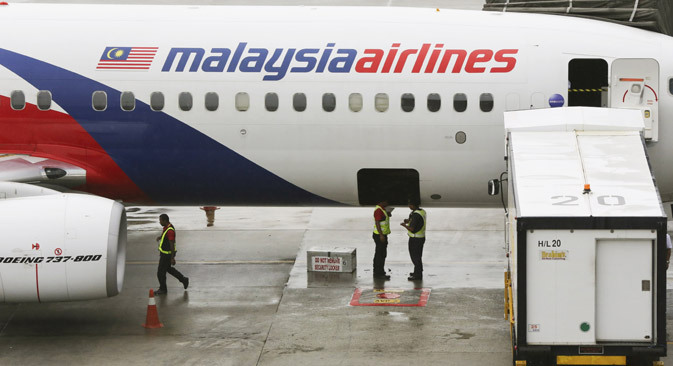 Malaysia Airlines confirmed that it had lost its connection with the airliner in Ukrainian territory approximately 50 kilometres from the border with Russia. Reuters reports that the plane strayed off its course before crashing. Bodies have already been detected near Snezhnoye. The wreckage is scattered over an area of about one kilometre. Both the Ukrainian Army and militias from the Donetsk People’s Republic have denied involvement in the crash. In a statement on his official website, Ukrainian President Petr Poroshenko said that the official armed forces had no part in it. “We stress that the Armed Forces of Ukraine did not take action against any airborne targets,” the statement reads. The president also noted that he had issued an order to create a special commission to investigate the incident. Ukraine’s Deputy Interior Minister Anton Gerashchenko said that the plane was shot down by a Buk missile. According to the Ukrainian armed forces, the militias possess Buk launchers. Sergei Kavtaradze, a spokesman for the Donetsk People’s Republic told Interfax that the militias had nothing to do with the tragedy. “The plane was shot down by the Ukrainian side. We simply don’t have such anti-aircraft weapons. We can shoot up to 3,000-4,000 metres, but Boeing planes fly much higher than that,” Kavtaradze told Interfax. The militias said they are willing to allow international experts in to investigate the causes behind the crash. “The government of the Donetsk People’s Republic is interested in investigating the circumstances of the tragedy and is willing to admit international experts to ascertain all the circumstances of the incident,” Prime Minister of the Donetsk People’s Republic Alexander Borodai told Interfax. Malaysian Prime Minister Najib Tun Razak said on Twitter that he is in shock. “I am shocked by reports that an MH plane crashed. We are launching an immediate investigation,” he tweeted. The country’s military has been instructed to investigate the matter. According to a statement on the Kremlin website, Russian President Vladimir Putin spoke with his American counterpart Barack Obama on the telephone, in which the Russian leader informed his colleague of the crash. Putin expressed his sympathy to the Malaysian prime minister. “The head of the Russian government sends his most sincere words of sympathy and support to the families and friends of the victims,” the statement reads. The United Nations have called the crash a tragedy, according to an Itar-Tass report. “We have seen reports of a Malaysian Airlines plane crash near the Russian-Ukrainian border. We do not have more information on this subject currently. This is a tragedy, and all our thoughts are with the fate of the passengers, crew, and their families," the UN’s Deputy Secretary General Spokesman Farhan Haq said. Russia’s Permanent Representative to the UN Vitaly Churkin also weighed in on the tragedy. “I’ve just learned of it. This is horrible. Of course, I don’t know anything about the incident yet,” he said upon returning from a Security Council meeting. The Security Council members have not yet discussed the crash, he said. Meanwhile, diplomats say the Security Council could convene again today.